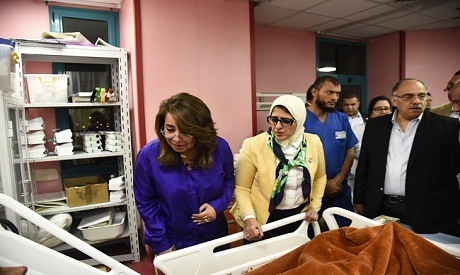 Egypt's Health Minister Hala Zayed said that almost all of whom were injured in a terrorist attack on a bus that killed at least seven Copts and injured 12 near the Monastery of Saint Samuel the Confessor in Upper Egypt's Minya last Friday have recovered or are in a stable condition. Zayed paid a visit to the injured at Zayed Specialised Hospital, after which it was announced that three of the injured remain in the intensive care but are stable. Seven Coptic Christians were killed last Friday when terrorists attacked with firearms a bus carrying Coptic Christians in Minya, according to health ministry figures. The self-proclaimed Islamic State terrorist group claimed responsibility for the attack. Last Friday's bus attack is the second terrorist attack of its kind. In May 2017, armed terrorists targeted a bus carrying pilgrims heading to the same monastery, leaving 30 dead and two dozen injured. Following the attack last Friday, Egyptian police said 19 gunmen involved in the ambush were killed during a raid on a hideout in a mountainous region west of Minya governorate Sunday.